Some physicians providing treatment for varicose veins may recommend injection with a solution that causes these veins to clot. When the chemical, a sclerosant solution, works as planned, it results in thrombus (clot) formation within the varicosities. 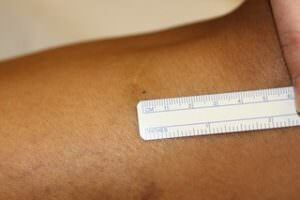 This effectively stops the veins from bulging with blood, and instead they bulge with clots. These bulging clotted varicose veins may or may not stay closed, as some may reform as varicosities. But if they remain clotted, they are firm, and often quite tender. They usually become much darker and may in fact stain the overlying skin. The staining is a result of the migration of iron within the clot to the skin, and appears as brown discoloration that may be quite dark. This unattractive look is called hemosiderin staining and may take months to years to diminish and completely resolve. In some few unfortunate cases, the stain is permanent. While there are laser treatments that may slowly improve the appearance, it is by no means certain to improve. A better solution than injection is surgical removal of the varicosities. An injection may sound better than surgical removal, but in my opinion the small surgical procedure is clearly preferable. The surgical procedure is called by several names: phlebectomy, ambulatory phlebectomy and others. I prefer to call the procedure microphlebectomy which implies small incisions and an excellent cosmetic result. The incisions are usually 1 to 3mm in length, usually require no sutures and in most cases cannot be found after a few weeks to a couple of months. The healing is excellent, and there are no adverse cosmetic skin changes such as skin staining. Bruising may occur and clears within three to four weeks. Picture taken one week after microphlebectomy of varicosity. Picture taken five months later, now healed after removal of the varicosity. Of course, patients with varicose veins should be evaluated, as the underlying cause of the varicosities must be dealt with lest they return after removal. 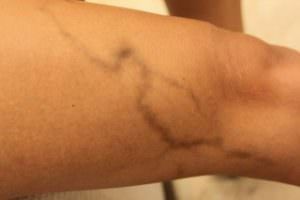 So in my opinion it is not a good idea to inject varicose veins. Vein doctors who are skilled in surgery achieve much better functional and cosmetic results with removal (microphlebetomy). That is why at Dallas Vein Specialists, the preferred way of removing bulging varicose veins of the legs is cosmetically conscious microphlebectomy. To schedule a consultation and evaluation with Dr. Whiddon, please call (214) 221-9222 today.